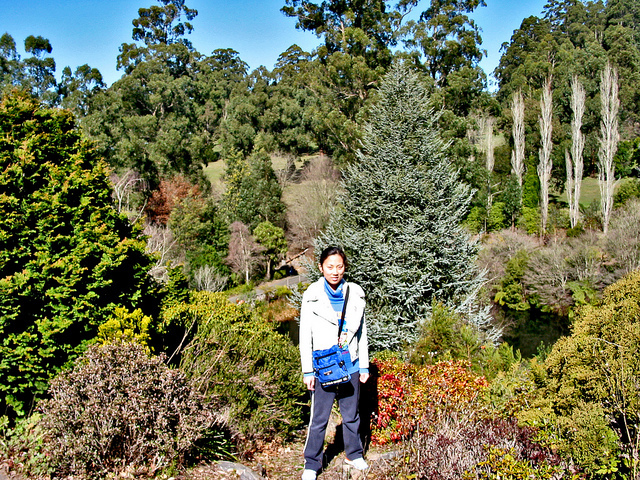 The National Rhododendron Gardens are a spectacular cool climate botanical garden situated on a hilltop in the scenic Dandenong Ranges, along The Georgian Road, 500 metres from the Olinda township and about 40 km east of Melbourne. 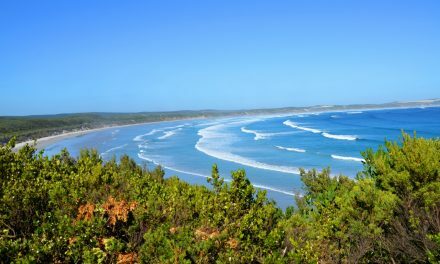 The garden covers an area of 40 hectares and has a long linear shape. 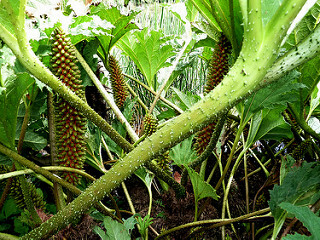 You can download a map of the garden here. 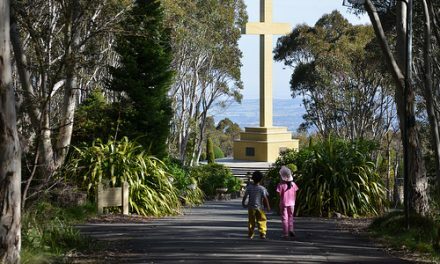 At an altitude of 500 metres, the garden has a temperature about 5 degrees cooler than Melbourne and an annual rainfall of about 1200 mm, almost twice that of Melbourne. The soil is deep red, slightly acidic, volcanic clay loam. Its clay particles retain good moisture level while allowing free drainage. 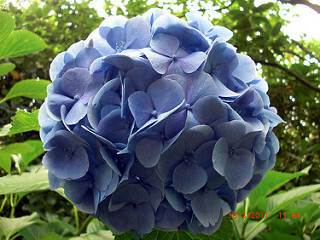 Hence, the soil is suited to growing a wide variety of plants. 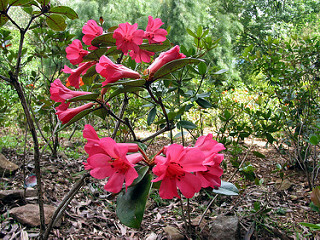 The National Rhododendron Gardens were founded in 1960 by the then newly-formed Australian Rhododendron Society (ARS) on land made available by the Victorian State Government. 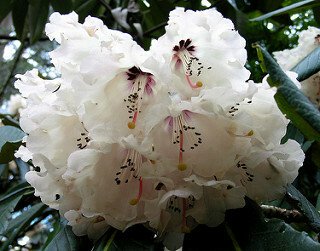 The original intention of the garden was to showcase the national collection of rhododendron species and cultivars. 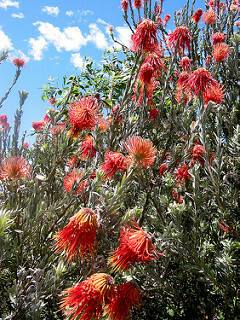 The founders however had the wisdom to also include a very wide range of cool-climate shrubs and trees. 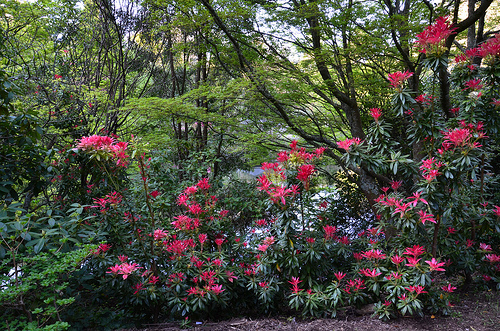 Thus today, while the main focus is rhododendrons, the National Rhododendron Gardens are also home to a very diverse range of cool-climate plants. 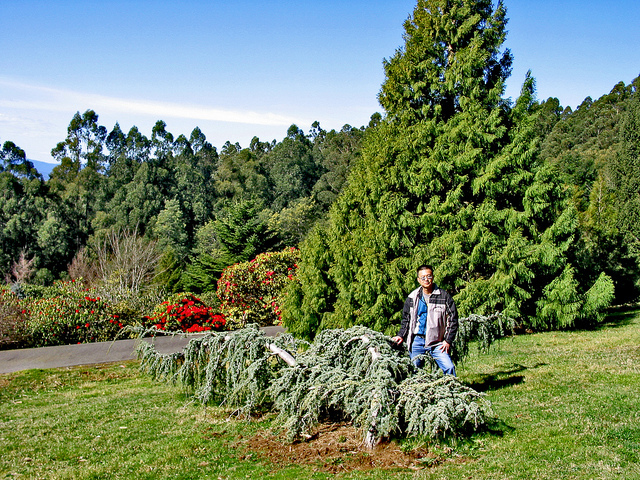 The development of the garden was carried out exclusively by the ARS and its members, with help from the State Forestry Commission and financial grants from various tourist bodies. The ARS started by clearing land and planting around the southern end of the garden. 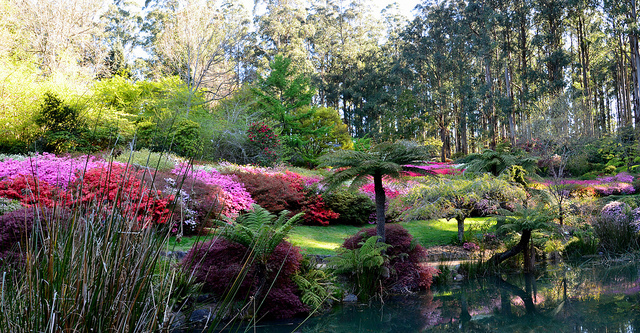 In 1962, the garden was ravaged by a large bushfire. While this destroyed much of the original plantings, it also saved much work by clearing the bush for the garden. 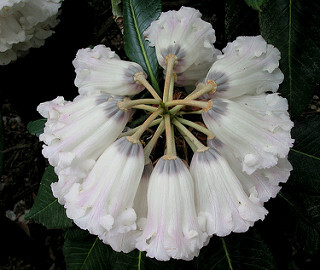 Many of the early plantings were propagated by the ARS members from their own collections, from specimens collected on trips to New Guinea, India and Nepal, and from seed and plant material donated by other international and national rhododendron societies. As the garden developed, the financial and administrative load increased, leading to an increasing involvement by the State Government in the late 1980s. 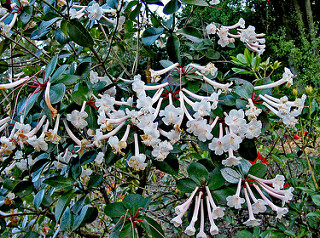 This culminated with Parks Victoria taking over administration and control of the National Rhododendron Gardens in 1995. 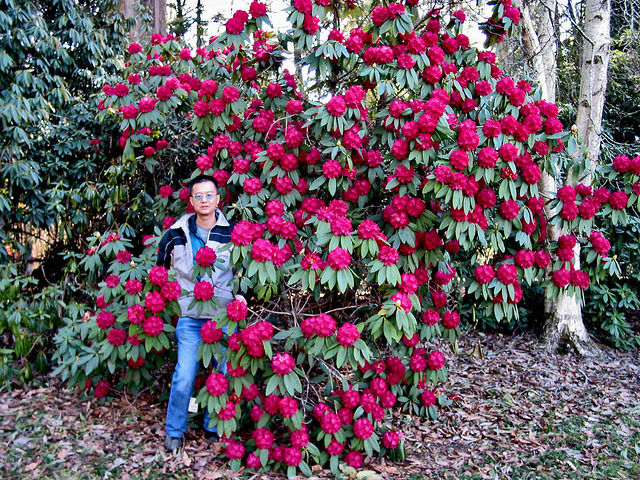 The National Rhododendron Gardens are now host to over 15,000 rhododendrons, 12,000 azaleas, 3,000 camellias and 250,000 daffodils. 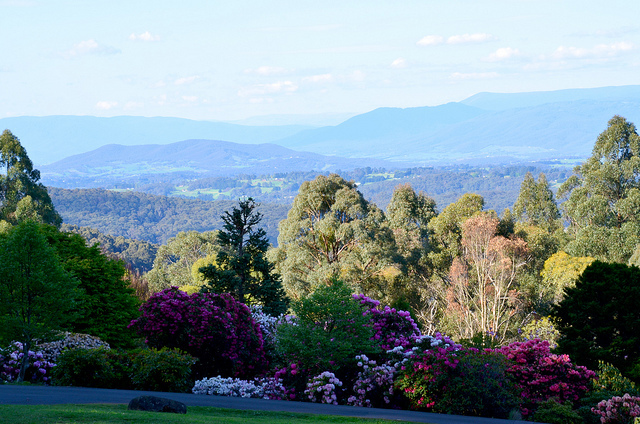 Set against a backdrop of the blue Australian Alps, the garden boasts spectacular views over the Yarra Valley. It also contains a large ornamental lake, a smaller pond, a Kurume Bowl (where lots of azaleas are planted), sensory gardens, deep fern gullies and small rock gardens. On a misty morning, there is a surreal atmosphere as the giant Mountain Ash (Eucalyptus regnans), tower out of the ground disappearing into the white fog. Most of these magnificent trees have grown since the fires in 1962. 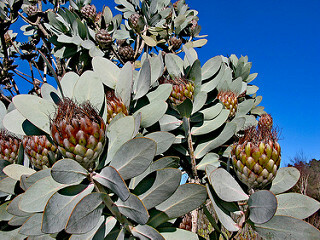 They are the tallest flowering plants in the world only outgrown by the Californian Redwoods. 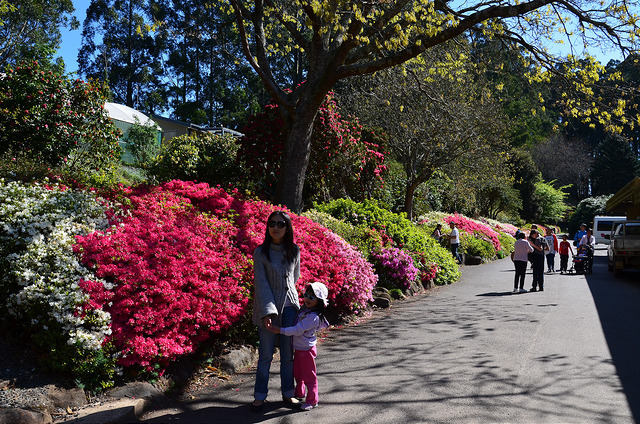 The National Rhododendron Gardens are a beautiful tranquil place to visit at any time of the year. 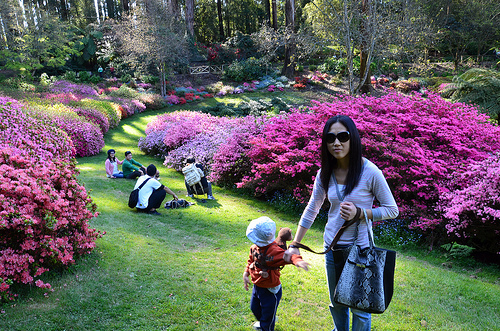 In early spring, you can walk the golden mile of daffodils and see many camellias and magnolias in flower. By mid spring, the Cherry Grove is in full flower. 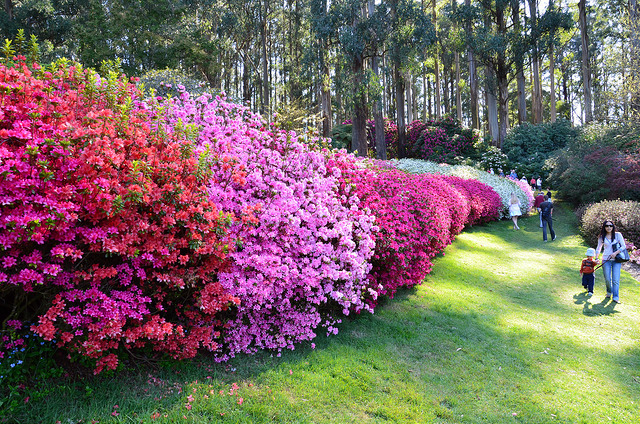 This time is also the peak season of flowering for the azaleas and rhododendrons. Summer is a great time to walk the nature trail in the cool rainforest atmosphere or picnic in the cool shade on the Cherry Lawn and wander through the collection of conifers. 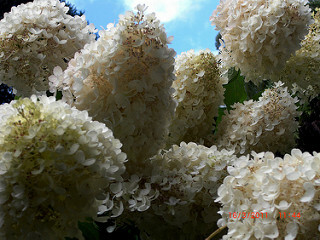 The brilliant blue and white hydrangeas can be seen in full flower with many large banks of them planted around the garden. Autumn is ablaze with colour as the deciduous trees and shrubs turn every shade of yellow, red and orange. The views by the lake are spectacular with many hydrangeas taking on rustic colours and are reflected in the cool calm waters. 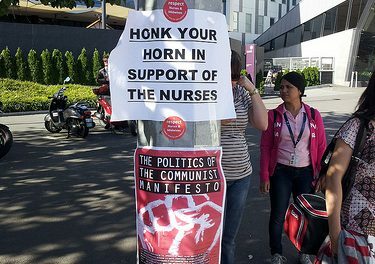 Winter is a season of contrast. The mists create an aura of mystery amongst the Mountain Ash and the air is always fresh and cool. Bare tree trunks and branches reflect in the mountain lake and in late winter, hellebore and cyclamen flowers carpet the ground. 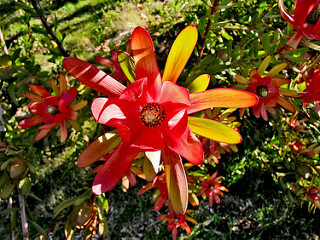 The Vireya collection can be seen flowering at all times throughout the year. 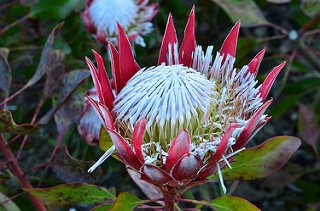 When I first saw the Protea (national flower of South Africa) atop Table Mountain in Capetown, I was mesmerized by its gigantic size and brilliant colour. 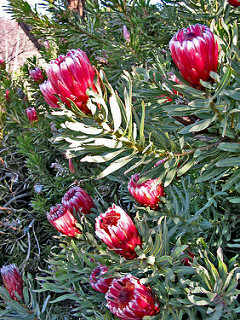 I am very delighted to see it again in Melbourne and I believe the variety planted in the National Rhododendron Gardens is the King Protea. 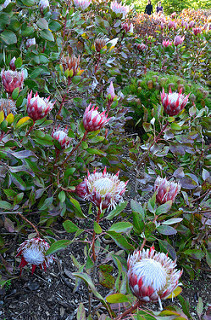 I do not know the name of the flowers in the third photo.